When playing Lego Creationary, make sure that your friends are done admiring their hard work before you salvage it for parts. 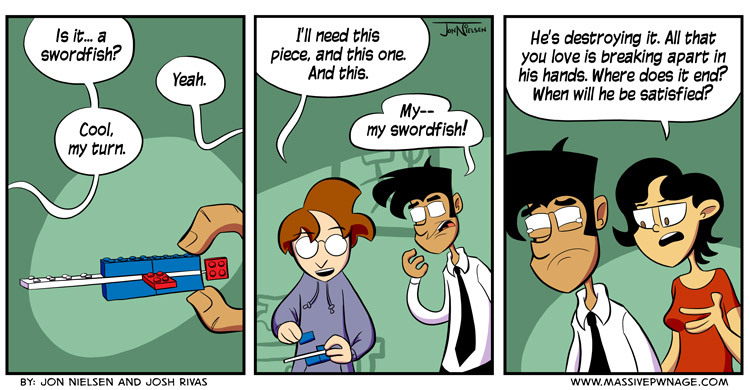 This entry was posted on Wednesday, May 9th, 2012 at 12:00 am and is filed under Comics. You can follow any responses to this entry through the RSS 2.0 feed. Both comments and pings are currently closed. Something touched my heart in that last panel but I don’t know what it could be.